Alongside with Horizon 2020, the European Union implemented an important program for the re-launching of the innovative entrepreneurship in the old continent. Admittedly without much imagination, the program is called “SME instrument” and I deem this intervention as (potentially) one of the most important and (hopefully) relevant in several years in the field of European industrial policy. 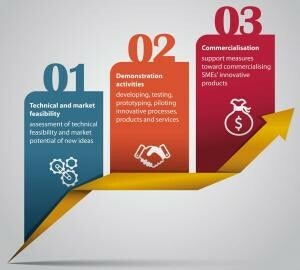 The SME instrument is a grant that an European start-up can win in order to test the feasibility, and eventually start the production and commercialization of a new product. Winning such grant is big money but it is certainly not a piece of cake. Commonly, many firms compete but only few succeed (success rate is usually comprised between the 5% and 10% of applicants). Economists define such approach as a ‘selective’ subsidy scheme. In other words, the public sector advocates for itself the ‘right to choose’ and ‘pick’ few selected entrepreneurial and innovative projects out of many possible. Somehow, this is a sort of Copernican revolution for many European countries which are more accustomed to rainfall subsidization schemes where no choice is made and available funds flow fragmentally towards too many prospects, with the large predictable final outcome of a waste of public monies. But how does the SME Instrument ’play’? The SME instrument program restricts its attention to specific industries and sectors considered of general interest (e.g. aerospace, nanotech, biotechnologies, ICT) and contemplates 3 distinct phases. The first stage provides seed-financing for feasibility assessment purposes (up to a maximum of 50,000€). The second phase grants an amount up to 2,5 Million € for innovation and development; while the third and last stage offers brokerage activities, business coaching and support for the commercialization of the innovation. Basically, there are 2 main reasons that are usually invoked to sustain a pro-active public approach in the domain of innovative entrepreneurship. First, valuable business projects may remain unexpressed and do not materialize because their intrinsic nature- highly technically complex and extremely uncertain- make them particularly unsuitable to get external financing from conventional private sources (e.g. bank debt). The thinness of the venture capital sector in Europe exacerbates the startups’ financial constraints. Second, innovative entrepreneurial projects are likely to generate spillovers for the society at large. The presence of positive externalities would lead to the underprovision of private R&D investments in these projects and this creates the need to complement these investments with public funds. One typical objection and critique which is diffusely moved against this typology of public programs is that the public actor would be unable to choose the entrepreneurial prospects better than private operators. I am not saying that the statement is necessary wrong…Of course, it may prove to have some merit. Here, I am only saying that this has not to be necessarily always the case. The best example to prove it is just noticing that the SME instrument is anything new. As a matter of fact, it is the best imitation possible in the European institutional context, of the famous and highly celebrated U.S. SBIR (Small Business Innovation Research) Program. The U.S SBIR program created in the 1982, was able to fund giants companies when they were unknown startups. The list is quite long and includes firms like Intel, Compaq e Symantec, only to mention few of them. One may easily question that the fact that these firms were financed at their inception and became leaders in their markets does not prove at any rate the real additional effectiveness of the policy measures since these firms could have reached their heights even in the absence of any public aid. Right….but as a citizen I would prefer not to risk and see these startups funded anyway. Also because these are “zero sum games” as some economists would say: if the entrepreneurial business idea does not materialize in a given geographical area (Europe in our case), the probability that it will see the light (with the annexed benefits) in other geographical contexts (e.g. US, China, India, etc.) is certainly not null. Looking at the sole phase II (the most munificent stage in terms of public money disbursed) in the last 2015 call, the countries with the more financed startups were Spain and Italy (with 28 and 26 firms, respectively), followed by United Kingdom (20), Germany (13) and France (8). Whether the new Google, Microsoft, and Genentech of tomorrow are concealed amongst them is too early to say. Time will give us an answer. But to say a priori that the SME instrument is not going to work is historically inappropriate and probably a little bit unfair.